Chia Ting Ting, the top advertising executive at Malaysia’s largest online news portal, appreciates something that many press advocates overlook: independent journalism requires financial independence as well. When Malaysiakini does a story on bonded labour in Malaysia, for example, its newsroom is rightfully praised. Rarely acknowledged, however, are the behind-the-scenes staff that create the breathing space for investigative and critical journalism. For Ting Ting, building a strong, diversified revenue base is her way of fighting the government pressure and corporate soft censorship that wield the greatest threat to speech and information in Malaysia. It’s why Malaysiakini’s 300,000 daily visitors can trust what they read. Malaysiakini was launched in 1999. Ting Ting joined in 2008 and started building the kind of revenue streams sought by online media companies around the world. By staying in tune with global developments in media and advertising and building relationships with mentors in the commercial advertising sector, Ting Ting has kept Malaysiakini in a position to challenge those in power. A financially viable online news outlet is rare anywhere. In Malaysia, it’s unique. “There’s no other [news] website in the country that’s actually making a profit,” says Malaysiakini co-founder Steven Gan. Malaysia has long been a country hostile to the press. For decades Freedom House has ranked Malaysia among the “not free” countries in its annual Freedom of the Press reports. Malaysia shares the label with media oppressive nations like Iran, Venezuela, and China. The introduction of the internet caused Malaysia’s government to choose between the economic benefits of an open internet and continued control and censorship of the press. The Prime Minister at the time, Mahathir Mohamad, chose the latter, declaring in a 1997 speech in California that online media would not be subject to the strict licensing that Malaysia’s offline media face. In 1998 the government passed the Communication and Multimedia Act, effectively forbidding censorship of the internet. Seizing on the loophole, in 1999 Malaysiakini’s founders Premesh Chandran and Gan launched Malaysia’s first digital native news site and declared its independence from political and corporate influence. In 2002, Media Development Investment Fund acquired a 29 percent stake in Malaysiakini providing funding and technical support for the site to begin diversifying revenue. 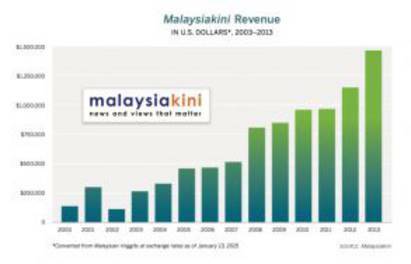 Malaysiakini has built a subscriber base of 16,000. The site’s educated, progressive subscribers view their site subscription as part of a larger movement for change. The site balances the need for revenue with its mission of reaching marginalized communities, putting its English and Chinese content behind a paywall, but offering keeping Malay and Tamil pieces for free. Under Ting Ting’s leadership, Malaysiakini has begun to offer premium advertising options and revamped the site’s layout to increase click-through rates. The company subscribes to Effective Measure and comScore, two marketing analytics firms, to better understand its audience demographic. The firm has engaged multinational corporate ad partners, which are less influenced by domestic politics. Malaysiakini is now experimenting with native advertising, ads that look and feel like the other articles on Malaysiakini’s site—though are clearly demarcated as paid-for—to move beyond the low impact and revenues provided by Google’s ad network. Malaysiakini is not immune to political hostility. In May 2014, the sitting prime minister sued the media company for defamation, marking the first time this has happened in the nation’s history. Malaysiakini’s financial durability became all the more important. Ting Ting’s own career started in politics, as a staffer for a state assemblyman. When the assemblyman lost his seat as the opposition came to power in 2008, Ting Ting eyed a career shift. Through her work in politics she had met Chandran and Gan—the trio developed a shared respect. That year Chandran asked Ting Ting to join the team. To achieve true diversification in revenue and ensure Malaysiakini isn’t beholden to one advertising source, Ting Ting believes there needs to be a clear line between the firm’s sales team and the editorial team. In 2014 Malaysiakini spun off its advertising division as FG Media – a wholly owned creative and advertising analytics firm that Ting Ting now leads— to do just that. This isn’t just so the editorial side isn’t polluted. It’s so the sales side can succeed. The sales team needs to have its own culture and focus, and be able to go hard on attracting advertising clients across the political spectrum. For Ting Ting, Malaysiakini’s push into native advertising builds on one of the firm’s traditional strengths: audience engagement. After years of building a movement around news, Malaysiakini knows its audience and knows which topics its readers will find compelling. Interestingly, and especially for a confrontational news site, advertisers often prefer native ads as an alternative to display ads, which may lead to a company’s logo alongside a controversial article. Having felt political pressure in the 2013 elections, Ting Ting and the team expect the same in future elections. Ting Ting’s strategy of developing broad relationships with advertisers has and will continue to help, she says. The company is expanding to different types of micro-sites to take the political heat off the central site. From Ting Ting’s perspective, developing a sustainable career in media sales means focusing on professionalism. To her its innovation, effectiveness, and good service that win over advertisers. So far she’s right.